*NEW* 29/02/2004 The .Hack set is up and I've started tidying up this page. The Yujin figures are still here! Gashapon generally refers to Japanese Capsule toys which are sold in vending machines. They are usually less than 10cm tall and are generally made of soft rubbery plastic or very hard and brittle plasic. Anyone who's played any of the Shenmue games on the Sega Dreamcast will know immediately what I'm talking about. 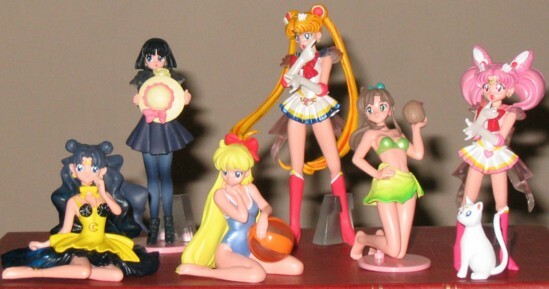 Often Gashapon are small figures of characters in anime or games although there are also a lot of real world figures such as animals, plants, cars, ships, planes, etc but these are perhaps less commonly seen outside Japan since they don't have the same international fan following. This is the first Gashapon set I got. I always really wanted a Morrigan figure but could only find Resin kits that didn't look anything like her. 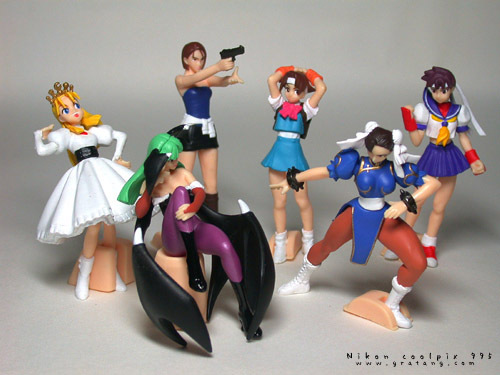 Then one day I stumbled across this HG (High Grade) "Capcom Girls" set made by Bandai that had other cool figures to boot. I can't remember where I bought them and don't seem to have the link anymore. The quality is really good and they even stand up properly thanks to the well designed foot holders. I've had them for over two years now and no signs of any warping or deformation. 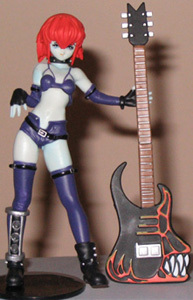 I should also mention that the Jill Valentine figure is not as blurry as in that picture. My one complaint is that the foot holders are pretty ugly (just visible on Sailor Jupiter's leg) and don't really work that well. The standing figures occasionally seem to fall over if they aren't balanced just right. There is also the followup #2 set but they're lesser known characters and are supposedly not as good quality according to some review I read. There is also a more recent #3 set that looks quite impressive but I've not seen any owner feedback yet. I have see set #2 doing the rounds on ebay of late and set #1 now seems to be a bit of a collectors item with prices to match. This is the Bandai Azumanga Daioh HGIF set. I believe there's another set around (the big "2" would duggest that too obviously) but I've yet to see any pictures of the set as a whole. Again, the picture doesn't do justice to the detail on these figures. Sakaki-san's jumper is impressively real and Kagura-san's headband actually has writing on it. I don't know of any online stores where you can buy this set, I purchased mine on Ebay and the price including getting it shipped to New Zealand was under NZ$30. I think I was quite lucky getting it at that price though, it seems to be a rather rare set these days. That said, it has been doing the rounds lately on Ebay. 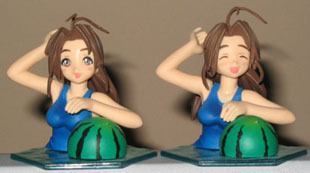 The Love Hina "Waterline" set #2 by Kaiyodo including all the Shinobu and Mutsumi variants. There is another set of a similar fashion (Waterline #1) but in my opinion it just doesn't capture the essence of the characters. Personally I think this set is just cool. They are quite large in comparison with other sets. Since they have these flat translucent bases they have no stability problems at all. Detail is great too. The only slight issue is they were quite hard to assemble with some parts requiring quite a lot of force and time to make the rubber interlock but this is only a minor complaint. 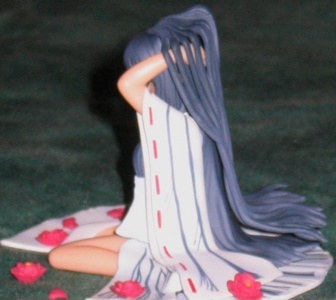 As a side bonus, the heads are actually interchangable with the "Skyluv Project" Love Hina action figures (page coming someday since I have two of these) made by Kaiyodo and Movic which can make for some amsuing poses (especially the swirly-eyed Shinobu ;-) . I picked these up by emailing a guy who ran a store on ebay and I think it was the only one he had. 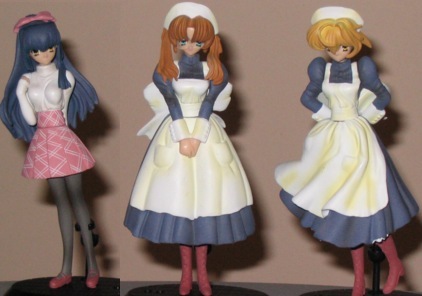 Very hard to find, I've never actually seen the painted set for sale online (only the clear variant at Asylum Anime) and the few places I saw that used to have it didn't have all the figure variants so I consider myself to have been very, very lucky to find these. In comparison with the first set I have from the same series, the level of detail is much higher in this set, Bandai has put a lot more effort into getting the colours right here in my opinion. The other great thing about this set is that the stands work really well while not being too intrusive like the white ones in the original set. Once again, I bought this set from Goblin Toys in Japan. Great service as always. Unfortunately my photos are a little blurry but the level of detail on these figures is second to none, especially the "Morrigan in leather/PVC" figure which is covered with little rivets and buckles. Zaberi's guitar is also very well done. Another big plus is that they are very, very stable and don't fall over unless you put them on really uneven surfaces. The plastic they are made of varies from piece to piece with some being soft and flexible to fit snugly and achieve the right look and others being hard and brittle to add strength and detail or just for applying shiny paint. The only negative thing I can really say about this set is that some pieces do not seem to perfectly join together but this cannot really be seen on the built figures unless you look closely with a critical eye. 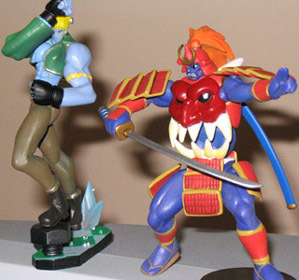 The figures themselves are really well made and are surprisingly big, they are actually the biggest gashapon I have with the stading figures being the height of a typical CD case. They all seem to be built from a rigid but still slightly pliable plastic. Stability is great, even the standing figures have these little rear clips to hold the figure in place (just visible in the left-most figure in the first picture) and they feel rock solid. All these more stable sets make me wonder how the Azumanga Daioh set went so wrong in that deparment. As I said before, I think the letter two figures are what makes this set great. 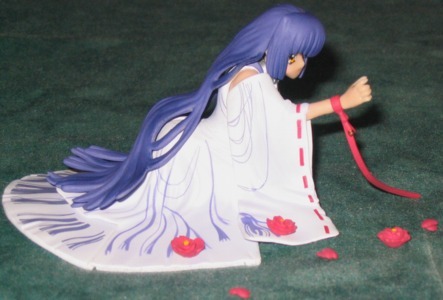 The loose little red flowers and petals were just a great touch that make all the difference and the way the flowing clothing has been done is easily some of the nicest design work I've seen on figures like these. I'd even go as far as to say the only figures I've seen with comparable attention to detail are resin kits 3-4 times the size or some of Yujin's SR-DX plastic figures about twice the size. To those wondering, both figures are fully naked from the front although the clothes and hair block enough that it's not tastelessly blatant. In case you are wondering if you're seeing things, the last figure does have her leg in different positions in the two last photos. She actually comes with two leg attachments, one that lies flat under her clothing and one that can dangle over an edge. The hair on that figure is also very impressive. As can be seen from the pictures, it has a lower piece and an upper piece with her hands fitting in between. 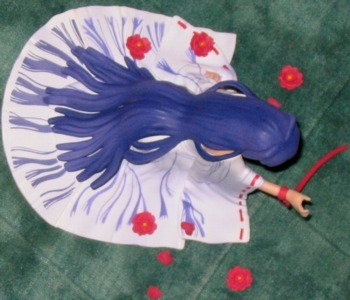 The effect of the two layers of hair is very impressive, I wish more figures, big and small did this sort of thing. I stumbled across this set on ebay. It seems somewhat rare and I haven't seen another available but I guess it's not really a mainstream set anyway. This is the second Bandai HGIF .Hack set with figures from both the .Hack games on Playstation 2 and from the .Hack//SIGN anime series, It's taken me a long time to put this set on here and the main problem causing the delay was that I was planning to get some good photos. Unfortunately though, this set has a problem that has stopped me from displaying it. I have never actually had it on display and as such never took any photos. Overall the quality doesn't seem to bad, the figures look a lot like the characters they are trying to portray and both the colours and detail are very good. The foot holders are the usual sort of thing, not spectacular but they do the business. At this point you are probably wondering what the problem is referred to earlier is. Essentially the material that the figures are made out of is far too flexible. This means that not only some parts of the characters bend very easily but the weapons are permantly bent. I have tried in various ways to force them to stay straight but to no avail. The worst parts are are Subaru's axe (number 5 in the picture) and Balmung's sword (number 3 in the picture) which just seem to have a permanent bend. Because of this flaw I cannot recommend this set but if this does not bother you, it is certainly is a very detailed and otherwise good looking set. I cannot help but feel though that it is not up to the usual standard of more recent Bandai HGIF sets. I found this set on ebay for quite a reasonable price. It does appear to be a lot harder to find now due to the popularity of .Hack merchandise but I do still occasionally see it around and there's at least one set (including the other colour variants) available on ebay as I type this.